This post is in partnership with Universal Pictures. We are officially on summer vacation here. One thing we love doing in the summer on humid days or rainy days is going to see a new movie. Despicable Me 3 is on the top of our list to see this summer and can’t wait! It hits theaters this Friday!!! Don’t worry about all your old friends; they are still here in Despicable Me 3. This time though, we get to meet an all new family member- Gru’s long lost TWIN brother! Can his brother convince him to get back into the villain business of is Gru really retired? Check out the official movie trailer for yourself. It looks so good! Despicably Delicious! Join Gru and his crew of Minions in a world of trouble with your favorite Kellogg’s® breakfast and snack products. Buy 6 participating Kellogg’s products, receive a $8 Fandango Movie Voucher. Find free Despicable Me 3 Create-A-Plates inside specially marked packages. Customize your Create-a-Plate and claim all sorts of fun this summer; get yours while supplies last! For more information, visit KelloggsMovie.com. 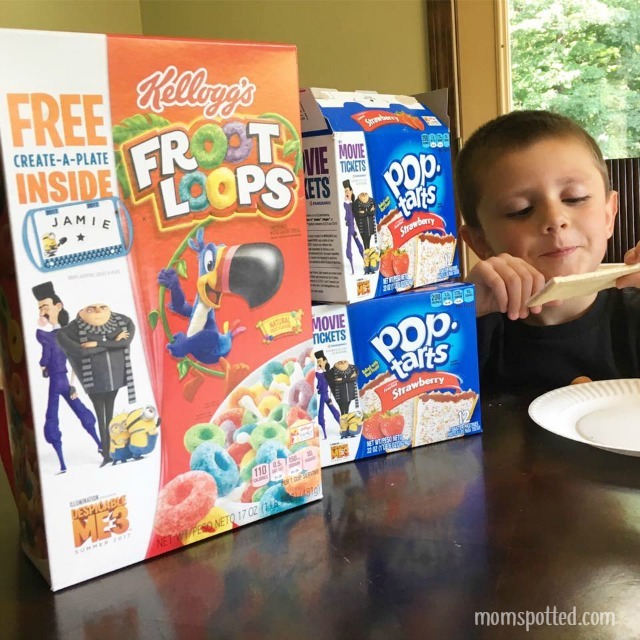 Follow Kellogg’s online on Twitter, Facebook, Instagram andPinterest. You can find Yummy Spoonfuls in the frozen section at Target, it’s 100% organic, non-GMO, preservative-free, additive-free and cooked on low heat (just like homemade) to keep all the nutrients locked in. Plus, there are Minions all over the box! Get a coupon at YummySpoonfuls.com. Since we can’t watch the movie just yet, we’ve stocked up on our favorite Kellogg’s products. Sawyer loves seeing all the Despicable Me 3 characters and fun on the boxes. Plus, he’s pretty excited to be snacking on some delicious strawberry Pop-tarts! A total double win as far as he’s concerned. 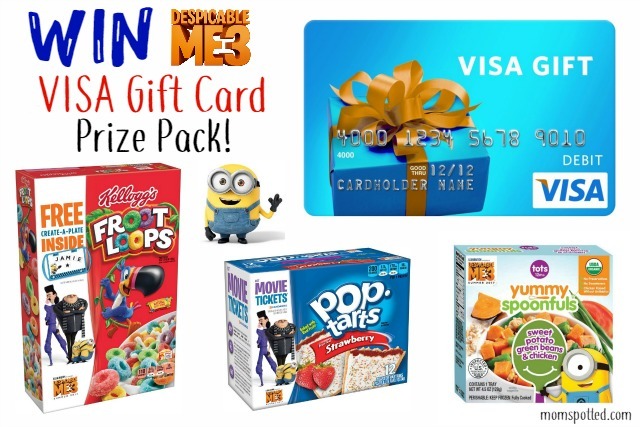 Right now (1)ONE Mom Spotted readers can win one (1) Despicable Me 3 Prize Pack! Contest ends 7.10.17 at 11:59 pm. For Official Giveaway Rules click here. U.S. Residents Only. I’d see it with my daughter. I would make a movie date with my boys. I would love to take my nephew to see this movie with me! I would go with my grandsons. They will love this movie. I would take my Granddaughter on a movie date to see this! I have a sweet cute, smart great little niece whom I love and adore. She would be my pick. I’d plan a movie date with my godkids. I would see it with my wife! This is going to be such a cute movie. I will be taking my nieces to see this movie! I would take my son! I would take my grandson to see this movie. I plan the date night with my husband and with my boys to see this movie! I would plan a movie date with my husband to go see Despicable Me 3. I plan to take my kids to see this, and probably my niece too. My friend Mari looooooves minions! My son wants to see this, I would take him and my mom . I would take my husband and boys to this. I would take my kids to the movie. I would plan a movie date with my grandson to see Despicable Me 3. He loves the Minions! I’d love to plan a date with my family! I would plan a movie date with my grandsons to see this movie! I would plan a movie date with my daughter to see Despicable Me 3. The whole family are planning to go soon. My date will be my 5 year old daughter. I want to see this movie with my son and daughter! My grand son would be my date for this adventure! I would like to see this movie with my daughter. Oh I would take our little one. Oh he is so excited to go and see this! Love those Minions! I would plan a movie date with my son! I plan on taking a movie date with my son and daughter. I haven’t been to a theater in 20 years, but my wife and kids go all the time. We buy the DVD’s for a lot of these kid’s movies, and I usually watch it with them then. My son Isaak is the perfect age to go see this with me. He’d be the one I’d pick. I want to go see this with my fiance;’. U plan a movie date with my kids to go see Despicable Me 3. I would plan a movie date with my daughter and my niece. I would like to take my niece and nephew to see this movie. I would take my granddaughter to the movie. I’d take my whole family; 2 girls and hubby. I’m already planning on taking my grandsons! I would take my husband and two kids to see this. We love the other ones. I would definitely take my daughter! I would love to see this with my little boy! We have really enjoyed giggling at the trailer. I would take my son and daughter to see this movie. I’d see the movie with my little girl. I would take my 2 granddaughters to see Despicable Me 3. They’re huge fans of the Minions. It looks like I may see it alone…. Maybe I get my adult son to go! I’d love to see Despicable Me 3 with my kids. If I was to see it, it would be with family. I plan to take the kids to see this one in theater. The whole family. We all love them :). I’d like to see it with my mom and grandma! I would bring the whole family! My daughters are 7 and 14. They are so excited for this movie! I would take the nieces and nephews to see this movie with me. I plan on taking my son to see this. I would take my 3 kids to see the movie. My movie date to see this would be my 11 year old, her best friend, and my 3 year old granddaughter. They are all begging to go and see this. I would take my youngest daughter to go see this. I would take our kids to see this. I would take my son to see it. I want to take my niece Alysia to the movie. Would take my sons to see this movie. I intend on taking my youngest granddaughter to see this movie. I would like to have a movie date with my husband to see Despicable Me 3. I will be taking my wife. I’d love to see this with my daughter. We love Gru and the minions! I am going with my husband. I’d set a date with my daughter! I would take my daughter to see it! I would take my child with me to see this movie. We loved the last one. I would love to take my daughter out for a burger and then on to the movie. Just mom and daughter night! I would take my grandson! I work with developmentally disabled adults and some of them love animated movies. I would take one or two of them for a movie outing. I’d love to take my two sons on a date with mom to see this movie. I would plan a date with my son! I would take my whole family on a movie date. I would take my husband he love this movie . He is a kid at heart. I am planning on seeing this with my son and daughter! I would go see the movie with my husband and our 2 sons. I would take my husband and our three sons. I would take my 2 kids. I really can’t sit through a movie with my back and knees so the date would be my daughter and my grandson but I would definitely be getting the digital version of the movie so that I could see it (many times) in the future! I would take my son and my niece to this movie. I would take my niece with me to see this movie. I would enjoy seeing this movie with the grand kids – talk about fun! I would like with my family! I am already planning a movie date to see Despicable Me 3 with my daughter; I can’t wait! I would take my nieces to see the movie. I would take my daughters to see it with me. I would take my daughter to see this movie. I would see this with my sister on a movie date. My hubby. We have been huge Despicable Me fans forever. And we love when the Minions sing in their language! Oh I’ll be taking my sons….they can’t wait. I’d take my son to see this movie, especially since he is looking forward to seeing it. I would love to plan a movie date with my little cousin Zander. I think the whole family would enjoy the movie.. but if I took just one, it would be my daughter. I would see it with my nieces and nephew. I will be taking my 14 year old we have seen the other 2 and i don’t think he is to old for a funny kids movie. I would like to take my son to see Despicable Me 3. I would take my niece and nephews. I would love to take my kids. All four of them love these movies and the minions. Who doesn’t? I would love to see it with my two boys & my husband! I would take my nephews to see this. They love the minions. My kids of course. Minion superfans. I would see the movie with my husband. We will wait until it comes out on DVD and check it out from the library to watch together at home. I’d probably take my daughter. I have a very good friend who loves that minions and has a lot of the paraphernalia and would love to see Despicable Me 3. My best friend! She and I laugh together all the time and we are OBSESSED with Minions! I would take my kiddo, he loves the movies. I would love to take my kids to see this movie!! I am planning on taking the whole family to see it at the drive in movie theater. i would take my daughter to see this movie with me. I want to take my nieces and nephews to see this one! I would actually go with my husband first. They we can take the kids later, lol. Cool prize I know my kids are wanting to see this. Love Kellogg’s products buy them all of the time. I’d like to go with my oldest son adn daughter! I would take my kids to see the Despicable me 3 movie. Believe it or not, my stepfather really wants to see this movie. I am going to watch it with my son. I would take my husband and 2 sons. My grandkids are my movie partners. We enjoy spoiling each other! I would take my daughter to see that movie. I’d like to watch this movie with my two teen sons. Thanks. I would love to take my niece to see this movie. Of course, my wife and two girls! I would plan a movie date with my grandson as we love these movies and have seen the other two. my daughter and her friends. I would take my girls with me to see the movie. Thank you! I would love to take my son to see it! My grandkids will love the movie! Thanks for the chance! My daughter, we always see movies together. I would like to go see this movie with my best friend. I would see this with my kids. I’d go with my best friend. I would take my family to watch the movie. I plan on seeing Despicable Me 3 with my husband. We enjoy the films even though our kids our grown. I’d go with my daughter. I would take my hubby and my nephew. I would take all 9 of my grandchildren!!! I would take my kids . They can’t wait to go see it. I would plan a movie date with my friend’s three little boys. I would go with my hubby. We just watched #2 together again. I want to go see it with a couple of my friends. I would take my grandson because he loves the Minions. I will my 6 year old twins! I would go with the hubby and my granddaughter. I would take my grandson to see the movie! MY GRAND KIDS WOULD LOVE THIS. My neighbor and her son would enjoy this. i plan on taking the kids with me to see this movie, we will love it. I would go with my husband and kids. We loved the other movies. I’m taking my kids on a date to see the movie! The whole family would be going to see the movie! It is a great family fun time! I would take my two youngest nephews to see this movie. They love the Minions! Thank you for the fun giveaway. I’m planning on taking my son to the movie. I went and saw it with my 9 yr old. I plan on taking my son and daughters. I would take my husband if I would go to see this movie! I plan to take my nephew. I would love to take my husband and kids! thank you for the chance! I’ll take my nephews on a date night to see this movie. I would plan a movie date to see this with my daughter! I would take my family. I would plan a movie date with my 2 sons to see this movie, they would love it. My two little ones would love to see this movie, they love the minions. I’d get together with a few friends, do a fun lunch, and then go see this movie. I would make a movie date with my nieces. I would take my daughter on a girls night out. We both love the movies and are lookinh forward to the third. Yes, we would plan a movie date. The whole family had been wanting to see this movie. I’d go with my brother! I would love to plan a movie date with my nephew to see this! I’ll go with my son, it’s one of the few movies we both want to see. i would love to take my boys to see this. they were just asking me today to see it. I will go with my mom. My husband. We can’t wait. I would take both my son and daughter to see it! I would take my daughters. Thank you for the giveaway. I went to the theater with my daughter, mother, sister, and niece. We really enjoyed this movie! I’d take my nieces to the movies. I would take my boys! I would plan a movie date with my husband and kids. I’d see it with my mom because she likes these movies. This would be a treat for my grandson. I would take my son to see this movie. I don’t drive and can’t afford to go to the movies but I’d love to see it when it’s on dvd or Netflix. I live alone so I would watch it by myself or have my nieces and nephews over. I would plan a movie date to see this movie with my grandchild. I would take my three kids who love the Despicable Me movies and are excited to see the 3rd film. My four kids are so excited to see Despicable Me 3. We love the Minions! I’m taking my 3 girls to it! I would take my mom and two nieces! My husband would love to take his niece’s daughter. Thanks for the chance to win. I plan to take my son. I’d take my son and granddaughter to see it! I would take my niece to see Despicable Me 3! She loves the 1st and 2nd movie! I would go with my daughter and husband. I would go to the movie with my daughter and wife. We would take our granddaughter. I would love to take my nephew out to see Despicable Me 3 as he loves the preview. I’d love to take my son & daughter! I would definitely plan a movie date with my daughter. I can’t wait to watch this movie with my children.